The Croydon Assembly steering group is meeting on Tuesday, March 14, at 7.30pm, at Ruskin House, 23 Coombe Road, Croydon CRO 1BD, to plan our campaign to take forward the draft People's Plan that was sent to you recently and is again attached. Our plan, created out of the work of the last Assembly in November, has already met with an encouraging response because it addresses why working people are powerless when it comes to decisions that affect their lives and communities. The situation is worsening day by day as cuts are made to education, the NHS, local services and jobs while developers and other corporate interests flourish. We should discuss how we can take the People's Plan out into the borough and use it to help organise a campaign to expose the absence of effective democracy and propose alternatives that will give people control. We would welcome you bringing your views and suggestions to the Steering Group. The manifesto is now available and will be launched on 19th March 2016 between 11.00 and 15.00 at Ruskin House with guest speakers. 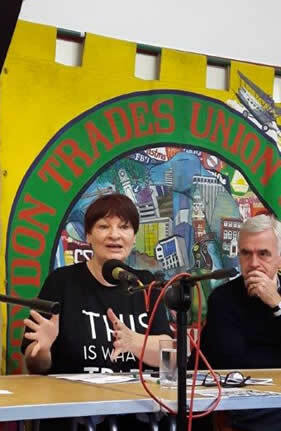 The old, top-down style of political party was a thing of the past, shadow chancellor John McDonnell told the Croydon Assembly at the weekend while explaining how Jeremy Corbyn had won the Labour leadership election. 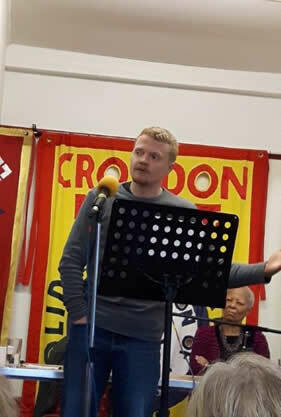 A wide range of community, trade union and campaign and political groups took part in the third Croydon Assembly which broke into groups to discuss a draft manifesto to campaign with locally and to form part of the national debate on policy. McDonnell said many of the policies in the manifesto had been voiced by the thousands who came to Corbyn’s campaign meetings and reported that the new generation felt “betrayed” by previous generations, especially when it came to the cost of education. While he acknowledged there was a “bit of a disconnect” between Labour’s rank and file and the parliamentary party, he insisted that experiences made during the campaign and since in the shadow cabinet, proved that politics had changed. He said that the party had to be driven by its membership. “Of course, the leadership has a role but at same time it has got to have a respect for our rank and file.” He said there were enough “existential threats” to unite the movement against the Tories. Blower said the legislation was “born of malice”, with the threat to political funding of the Labour Party and the undermining of trade unions by blocking the practice of deducting subs from pay. Blower attacked the way schools had become “exam factories” while new legislation which would prevent parents and communities from opposing the creation of Academies in their area was a denial of their democratic rights. Ted Knight, Croydon Assembly chair, said we had seen the impact of “change politics”. The enthusiasm for Jeremy Corbyn’s campaign, with 600 people flooding into Ruskin House was just one example. People wanted more than just a call for an end to austerity, he told the Assembly. They wanted “a new society, to break the grip of the global corporations”. The Assembly’s draft manifesto was not aimed at “patching up a broken system” but at replacing the system and building the confidence of working people that change can happen. 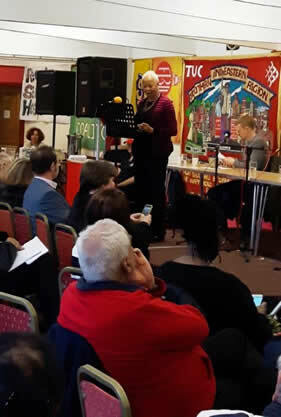 Ellen Clifford from Disabled People Against Cuts condemned the attacks on welfare aimed at the disabled, while Ellen Lebethe from the National Pensioners Convention outlined the demands of older people. 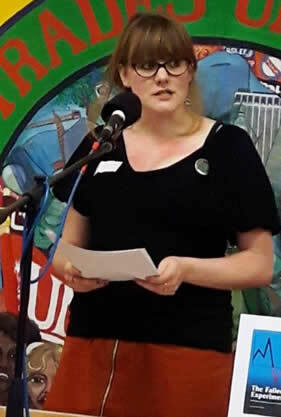 Candy Udwin, who was sacked as PCS shop steward in the fight against privatisation at the National Gallery, explained how the public had rallied round their struggle. She was later reinstated. Andrew Fisher exposed the “Tory lies” over austerity with a contribution based on his book, The Failed Experiment. The Tories, he insisted, had made political choices when it came to the cuts and they had decided to slash spending on welfare and services. Submissions to the Croydon council on the Croydon Growth plan compiled by the assembly forums can be veiwed under the section the future of the local economy on the main menu. The Assembly is an Initiative by Croydon Trades Union Council. Calls on the Croydon community, campaign groups and trade unions to work together.